If your skin is anything like mine, the winter months really take their toll on the condition of my skin. I know that I definitely don't drink enough water (which would probably improve it quite a bit), but I will admit that I also don't give so much attention to sorting out how dry my legs and arms are because they're always covered up, unlike in the summer. 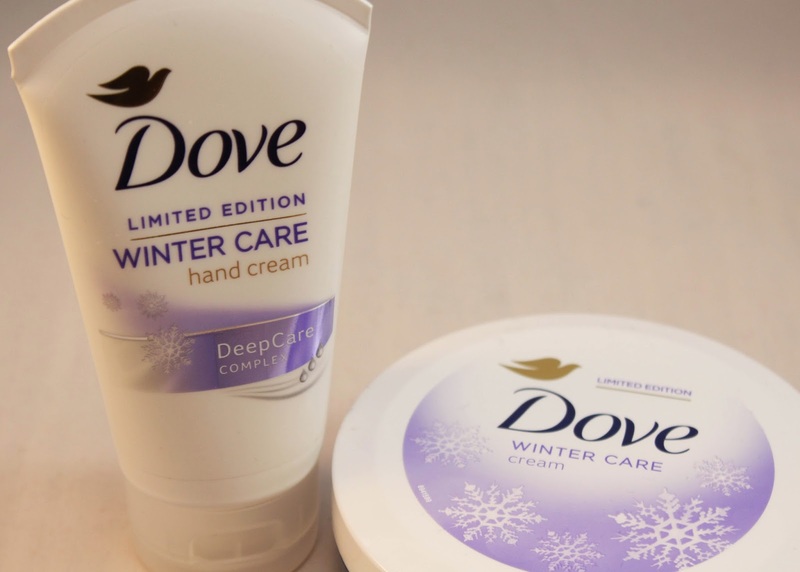 As a limited edition range, Dove brought out some Winter Care products which are specifically for combatting the effects of the winter elements - warm heating, cold outdoors etc. I tried out the Winter Care Hand Cream and the Winter Care Cream. I'll start with the Winter Care Hand Cream - if you're a regular reader of my blog, you'll know that I love trying out new hand creams. I would put this on the night-time end of the spectrum of hand creams I've reviewed, because although it is beautifully smooth and silky to rub in, it does not absorb very well at all so would be hard to use it during the day and go about your daily life easily! It has the familiar comforting Dove fragrance to it and when I use it at night it does leave my hands feeling soft and hydrated in the morning. It's certainly an affordable option for a hand cream (£3.49/75ml) and a nice winter addition to my hand care routine. The Winter Care Cream has the same fragrance as the hand cream and similar properties, too, actually. It's a very thick cream - I think I made the mistake at first of trying to rub in too much when I put it on my legs, so it's a case of less is more with this moisturiser! Like then hand cream, I'd say it was a night moisturiser - if you were to put it on before, say, wearing tights, it would feel rather uncomfortable and sticky. At night, however, I don't mind the feeling of having cream on my legs - and it does do a particularly good job of rehydrating my very dry skin. In the morning you can even still feel it there a bit, which shows how rich it is. Again, it's an affordable option for a winter moisturiser (£3.29/150ml) and the tub will probably last you all winter. What are your favourite winter hand creams and body creams?